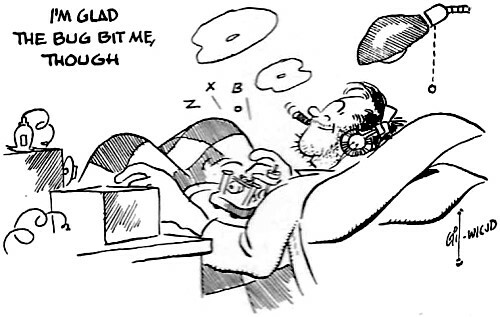 Here is a story - probably not too far from being true - about a Ham operator (emphasis on 'operator') who parlayed a short spat of poor health into an opportunity to get in a little rag-chewing time. The whole scenario turned out so well that he pondered afterward whether he could indulge in a bit of malingering for a repeat opportunity. So did some of the contacts he told about it while laid up. Finding time for a hobby is a problem in this workaday world. It's worse when you've a wife, two demanding kids, a car to wash on week ends, fences to paint, and lawns that grow faster than you can push the mower. You'll rediscover the cobweb-clearing importance of your hobby. After you're well, you'll find it's easier than you thought to set aside a little daily time for it. If it's hamming you'll reawaken to the forgotten fun of rag-chewing. The flu bug recently bit me, along with about 100,000 other Los Angelenos. 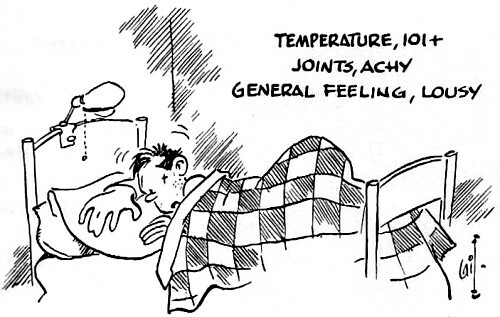 Temperature, 101 plus; joints, achy; general feeling, lousy. The doctor stabbed me in the counterpoise with 750,000 units of penicillin and put me to swallowing sulfa tablets. The combined curative input must have been a kilowatt. The temperature meter showed normal by next morning. 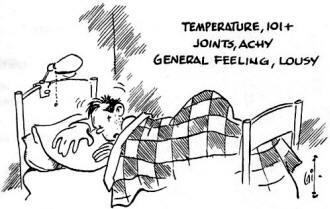 But the Fever Control Commissioner, or doc, ordered two more days in bed. Two big fat luxurious days - with the fellows in the office to carry on my work if it fell behind. My XYL carried out my well-polished breakfast dishes. I lay there eyeing my usually neglected, always faithfully waiting station on its desk in a corner of the room. Twenty-five watts, crystal-controlled, on 40-meter c.w. A two-tube regenerative receiver. Both were built several years ago to ARRL specifications. I wondered what signals were pulsing even then through the ether of my sickroom. The excitement was irresistible. I slipped out of bed into robe and slippers and seesawed the desk over next to my bed. A mayday call to the breakfast room brought my XYL with pliers and wire to lengthen the single-wire feeder, the receiving antenna, and the keying connection. Back under the covers, I turned on the switches and sat back against two upright pillows. A large wooden tray, upside down on my lap, was my operating desk. "CQ, CQ, CQ ... " The keying bug's healthy snap concealed the flu-bug weakness in my wrist. There was a reply, and it brought the company that misery loves. "Well, Gene, have you had the flu yet? I just got over it, and now I have a peach of a head cold." This naturally led to a comparison of temperatures, symptoms, and treatment. W6JZV, Sierra Madre, confided: "I'm supposed to be sick today. I came down wid a vy bad sore throat last nite. So the XYL insisted that I stay home." This being a QSO during most folks' working hours, he inquired: "What do you have for an excuse?" I recited my own miseries, and we had plenty of grist for rag-chewing. W6CDG, West Sacramento, reported: "All OK hr but lot of flu went around." W6QIA/6, Daly City: " Boy, flu is all around hr but so far I am vy lucky and missed it all. Wrk in grocery store and meet quite a few people who come in to do their shopping and have the flu with 'em. Am really worried abt blasted stuff." Meanwhile I had gone all out - or all down ­in operating comfort. I'd stretched out flat. The receiver was dragged over to he edge of the desk so the dial was within easy reach of my left hand. The keying board, on top of the covers, rested against my leg. What are they measuring your temperature with? Tell them to put on a voltmeter and, when you get to a kilowatt, to put in a resistor .... "
That evening the aging little 25 watts proved it was still good for fair DX. On my back, I worked stations in Indiana, Texas, Vancouver, B. C., and Honolulu. I'm back on my feet and back on the job now, and the station is back in its corner. I'm finding an hour or a half every day for hamming. Plan­ning and building new gear. Rag-chewing with new-found friends like GWI and QIA. QIA greeted me last night, from 400 miles up north, with: "Sure am glad to hear the flu bugs are letting you alone." I'm glad they bit me, though. 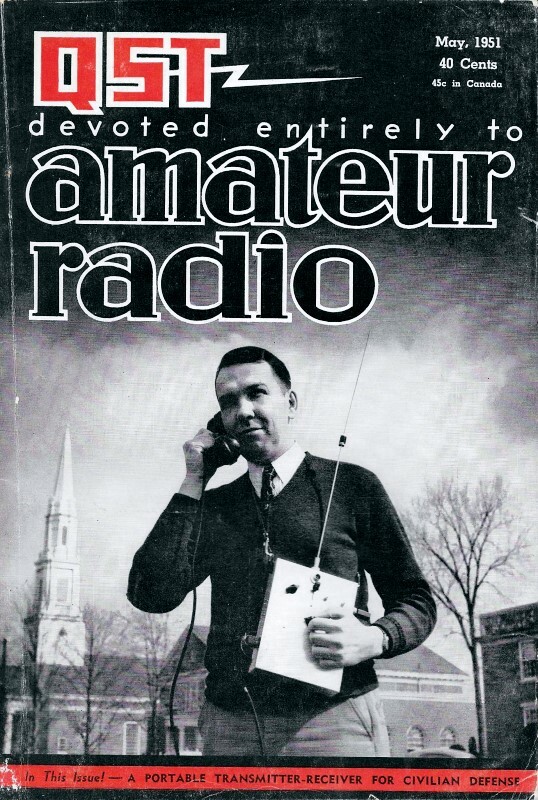 They reintro­duced me to ham radio.